Hi everybody! Ready to build a beautifully simple and addictively engaging dashboard? Dashboard 3 breaks all of those 20th century U.S. social security cards out by the 32,600 unique names in this data set. Tableau scales each name’s rectangle by how many times it occurred, starting with the most popular names in the upper-left corner all the way down to that sea of uncommon names in the bottom-right corner. We’ll also tackle your first calculated field to create a nifty alphabet filter at the top. 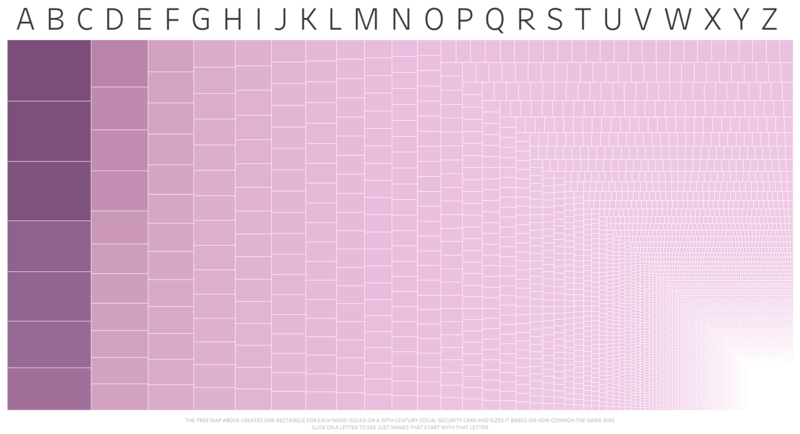 Click on a letter and our treemap narrows down to just names that start with that letter. Here we go! Thanks so much for building Dashboard 3 with me! I’d love to see what you’ve built. Just add your Tableau Public link in the comments below. And what are your thoughts about Dashboard 3? I’d love to add your ideas to future videos. Share below!